﻿ Bairnsley Highlands - History of Highland cattle coat colour. Since Highland cattle are an ancient breed whose lineage can be traced back hundreds of years, it is not difficult to believe that they come in all sorts of colours. What is interesting is that as recently as the early 1800's, they were nearly all black. These were the Kyloes from the West Highlands and Islands. Some also knew them back then simply as 'black cattle'. While two to three hundred years ago, the prevailing colour was black, there were a few of other colours including reds, brindles and some dark duns. It was also common to see flecks of white or white patches on them (see 'parti colour') and this was considered a sign of good milking (see 'white udders'). 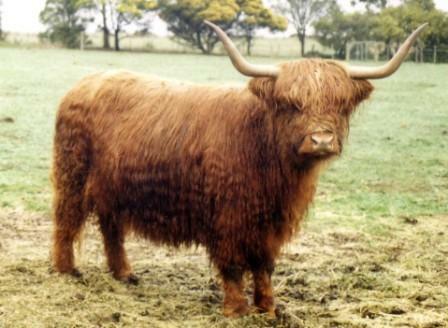 The cattle from the West Highlands and Islands were described as '.....small, shaggy coated, horned and usually black or dark brown occasionally with white flecks or white underbellies.' These were the classical smaller, hardy Highland cattle, reared on the heather and battling the weather. During the 1900's anything with white on it, and brindles to a lesser extent, were out of favour in most folds in Scotland. While there were some red animals, it is said that they struggled somewhat in these harsh conditions. On the mainland or lowlands though, the sheep who traditionally were grazed on the better pastures, were starting to make way for cattle. When Highland cattle came down onto this country it was noted by some breeders that the red animals seem to grow faster and to a larger mature size, and so produce more beef, than the black Highland cattle. This was the start of the dramatic change in colour preference over to reds because of a perception of size. Some feel that this coincided with a loss of 'hair and horn and hardiness' unfortunately. By the time the first Scottish Herd Book was started in 1884, the proportion of black Highlands was around 25% by registrations. By a decade later it was around 10%. Nearly a century later in 1970 the Highland breed was at a low point in number of registrations and the black cattle accounted for less than 1% of them. Currently the black colour is having a bit of a resurgence, not for any particular reason other than preservation of the colour before it was lost, and for some, nothing more than fashion. What has been observed by some is that black Highlands are often slightly smaller than their red counterparts, perhaps a throwback towards the West Highland and Island cattle from a couple of centuries ago. While as individual breeders, our eye can not help but favour a particular colour, in the end a good animal is a good animal and colour has nothing to do with this fact.